Doctors and hikers alike are on high alert with the expansion of the Powassan virus, a potentially fatal infection spread by ticks in the Great Lakes region. This virus can be tricky because the first warnings are simply flu-like symptoms, if any at all. After that, the brain may swell causing headaches and potentially even seizures. Currently, there is no cure or preventative treatment available, according to CNN. Although rare, this virus can cause sickness in its host just 15 minutes after being infected. Three kinds of ticks can carry the virus: blacklegged ticks (Ixodes scapularis), squirrel ticks (Ixodes marxi) and deer ticks (Ixodes cookei). 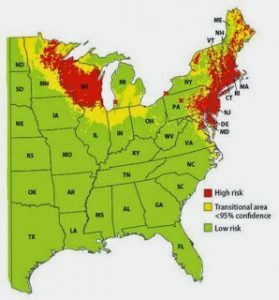 Deer ticks also can carry Lyme disease, according to New England Channel Network. The Centers for Disease Control says there have only been 75 cases in the last decade, eight of them from Massachusetts alone. Due to the warm winter this year, the ticks did not die out, causing a higher risk for infection.